Appointment of Independent Chair brings a new era of tennis to Wales. Cawte, a Newport resident, already has strong links with Welsh tennis having taken over as General Manager of the Swansea Tennis Centre in 2011 when Swansea City Council closed it due to a lack of tennis users, and then agreed for it to be re-opened under a new Community Social Enterprise called ‘TennisSwansea365’. Under Cawte’s innovative and dynamic leadership, he helped transform Swansea Tennis Centre into an award winning and sustainable centre running at full capacity. The centre is now considered by the Lawn Tennis Association (LTA) and the Tennis Foundation as best practice for other community indoor tennis centres across the UK and the LTA and they have regularly used Cawte’s services as a consultant to help develop other centres. Cawte has since moved on to become the National Tennis Manager for Greenwich Leisure LTD (GLL) the largest Leisure and Sport social enterprise in Britain, and in his role with GLL he has overseen the emergence of GLL as the largest public provider of tennis in the UK. Cawte’s new role marks the first time that Tennis Wales have appointed an independent Chair, and it is an important part of their new plans to transform community tennis participation in Wales. The organisation are taking an increasingly strong focus on developing tennis participation across new areas, and to make tennis more accessible for all members of its communities that normally would not have the same tennis opportunities. Tennis Wales are currently completing their new Vision Plan with this theme very much at the heart. 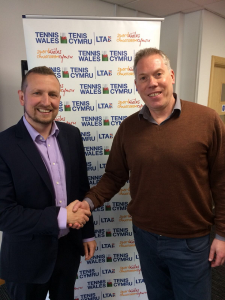 Of his new role with Tennis Wales Cawte said “I am very excited and passionate about taking on this crucial role as the organisation moves into a new vision, more so because it’s the first time that Tennis Wales have appointed an Independent Chair. I am absolutely determined to ensure this will lead us to a new era for Welsh Tennis, and our plans to transform community tennis participation in Wales. My focus lays in ensuring our organisation is best equipped at all levels for delivering on its vision of developing tennis participation across non-traditional community areas, and to make tennis more accessible for all members of its communities that normally would not have the same tennis opportunities. I want Tennis Wales to be at the forefront of excellent governance and to be the envy of other NGB’S for our commercial innovation and of course our impact on the game at all levels in Wales and beyond. I will only be content when we realise our vision for Tennis Wales which sees ‘tennis for everyone, everywhere, inspiring Wales to be happy, healthy, and active’”. Tennis Wales CEO, Peter Drew said “It’s fantastic to have someone of Barry’s expertise and passion joining Tennis Wales in this role. It’s an exciting time for Welsh tennis with some great success being achieved, and now we want to take the next big step in our journey towards making tennis accessible to everyone across Wales. Tennis is an inclusive sport which can be played by all ages and abilities, and we believe that tennis can be a great vehicle for improving people’s lives, improving their health and well-being, and improving communities across Wales. That is our vision. Barry’s appointment is an exciting and really important part of us bringing that vision to reality”.